I have had a very lazy day today because I have had a splitting headache most of the day. It is beginning to clear now though. 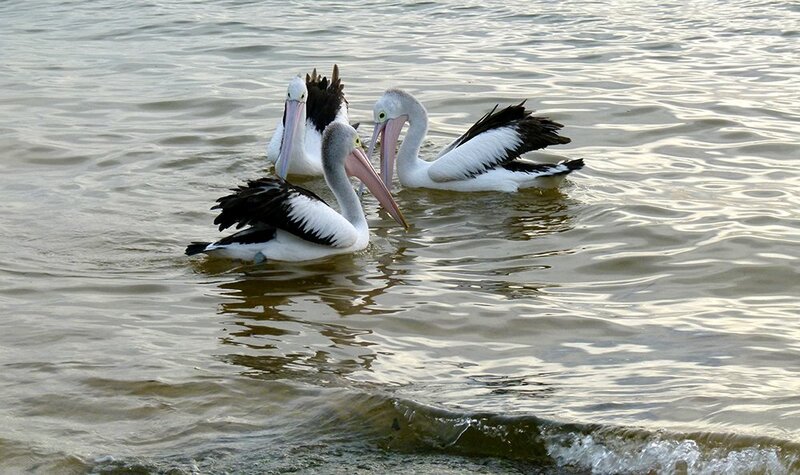 Over the next few days I will post photos of pelicans at Little Beach. This scene made me smile because these three pelicans were just swimming around in a circle. I don't know if they had their eye on a fish or just playing. Great shot. A very appropriate title. Fav. Well spotted. Great omposition and light. A magnificent shot and title! They are stunning, fav! Super -- I hope they all won't fall down !! the three seem to be in harmony ! Great capture, hope they don't get dizzy! Lovely shot & very apt title! their beaks are in the way for them to become intimate. I love this, and your title is perfect! I really do love these guys. @777margo @sangwann @happysnaps @ulla @lyndamcg @haskar @olenadole @annied @ludwigsdiana @gilbertwood @inthecloud5 @carole_sandford @nicolecampbell @yaorenliu @louannwarren @deborah63 @merrelyn Thanks. They are so entertaining when they are in a group especially if someone throws them a fish from the fish cleaning station close by. @kjarn @hermann Thanks, headache much better now. I think the pain came from my neck, just need a neck transplant and I will be fine. @beryl They will only be in harmony until one of them spots a fish and then there will be a free for all. Glad it is lifting. Headaches are horrid. Love these three, they made me laugh. Hope you are better now. Nice, crisp shot! Happy Gang...and as you said...for the timebeing. Beautiful shot of those three beautiful birds. Hope you`re doing better by now. Looks like they are having a grand ol' time- fun catch! Super shot... great focus and formation. Wonder what they're chatting about? Great shot Babs. @mittens @kwind @loweygrace @danette Thanks, they are fun to watch. @golftragic I guess the conversation would be about fish.